When selecting equipment for a chemical, pharmaceutical and food manufacturing facility, it goes without saying that you need to ensure you’re complying with regulations and hygienic safety standards. When it comes to manipulators, an easy way to do this is purchase equipment manufactured out of a specific material. That material is stainless steel. 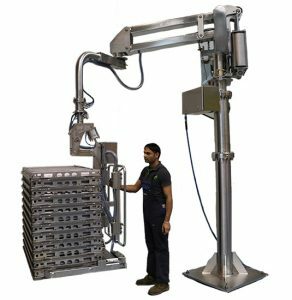 There are a number of reasons why stainless steel industrial manipulators are the right choice for facilities in sensitive fields like food and chemicals — and a good option in general. For one, equipment made out of stainless steel is resistant to corrosion. That means there are no worries about rust affecting the performance of your machinery or forcing you to replace the equipment sooner than you’d like. Stainless steel can also stand up to very high and low temperatures, making it ideal for use in a wide range of environments and in dynamic conditions. All of this is due to what is known as the “passive layer” that forms on the surface of stainless steel, which is technically classified as “inactive or inert.” This is what makes stainless steel the ideal hygienic material for your facility. The finish of the steel is so microscopically smooth that bacteria essentially can’t find anywhere to hide, allowing you to easily wipe any potential contaminants off your equipment. Whether it be bacteria like salmonella or caustic chemicals, you can be sure that your equipment is fully disinfected and safe for use. The benefits of this are fairly obvious — you can cut down on cleaning time and save money by investing in equipment built to last. Whether it be equipment that directly participates in the manufacturing of your products, or machinery built to transport your products throughout your supply chain, stainless steel equipment is the easy choice. If you’re in need of new equipment for your facility, then our Stainless Steel Partner Equo industrial manipulator is ideal for handling materials in these fields where cleanliness is essential. The Stainless Steel Partner Equo will help you keep your facility safe and compliant, allowing you to efficiently and ergonomically move sensitive items where they need to go without risking contamination. To learn more about this manipulator, click here.